The Stars Now Unclaimed (2018. 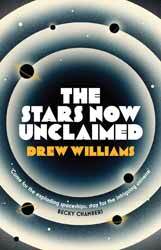 441 pages) is the first book in a series of space opera novels, written by Drew Williams. It is his first novel. If you are of a certain age you would have been introduced to science fiction through a pantheon of novelists, some of whom are starting to fade into history. Science fiction has never been a homogeneous art form, but has changed through the decades, often with new writers trying evermore inventive and experimental ways of telling stories, but at heart there remain a lot of readers who miss the simplicity of a good story being told well. Unclaimed has more in common with Asimov’s foundation stories than some more modern authors work. You are introduced to civilisations which are able to traverse the galaxy in intelligent AI ships; the author quite rightly does little to explain the science behind much of what is going on, because the book is a romp, an entertainment, not a physics lecture. The story, and even writing style, calls back many a loved book written in the golden age of science fiction where a good central idea is used to take the reader on an adventure, involving action (there is a lot of action in the book), set against various galactic wonders. We are introduced to an unnamed female character, our narrator, who is sent to a planet which has lost all of its technology, in search of one of the gifted children. This is not as easy as it sounds. The first problem is that the planet has residual radiation from the Pulse and so any technology she takes with her will quickly fall apart. Secondly, she is not the only person trying to find the children. The Pax, a warlike, movement, are also looking for the gifted to add them to their armies of conquest. Dressed from head to toe in black, the Pax consist of many races and their only goal is to invade worlds in order to turn the populations into more slaves for their army. You can join or you can die. Our operative is able to find the gifted girl, Esa, but not before the Pax attack. The two flee the planet with the help of the Preacher, a Barious, a race of intelligent artificial bipeds, heavily pursued by the Pax. Along the way they pickup other friends, but always they seem to be pursued by the Pax. I have to say that I enjoyed the story. It had a certain simplicity of form, confident enough not to add complexity for complexities sake. The characters are fine, and most of what you learn about them is through the dialogues they engage in, they are a little stereotypical, but not enough to spoil the overall enjoyment of the story. If you enjoy books by Asimov or Gordon R. Dickson then you’ll certainly will want to check out this new series.